Researchers from the Helmholtz-Zentrum Berlin für Materialien und Energie Institute demonstrate how it is possible to induce a magnetic order on a small region of a material by using a small electric field, instead of commonly used magnetic field. Te researchers used a wedge-shaped polycrystalline iron thin film deposited on top of a BaTiO3 substrate (a well-known ferroelectric and ferroelastic material). Given their small size, the magnetic moments of the iron nanograins are disordered with respect to each other, this state is known as superparamagnetism. Researchers from MIT, the Max-Born Institute, Technische Universität Berlin and the Deutsches Elektronen-Synchrotron (DESY) say ferrimagnets-based spintronics devices could be faster than ferromagnets ones. Ferromagnets are traditional magnets - such as iron. 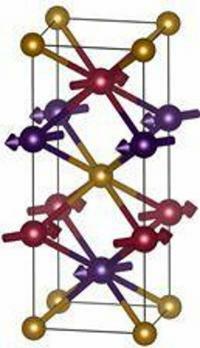 Ferrimagnets are materials that have two types of ions with magnetic moments that are not equal - and are also polarized in opposite directions.Using these two ion types could be used, according to the researchers, to create smaller bits in magnetic memory as these will allow faster domain wall dynamics to occur. 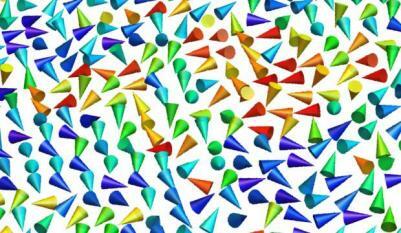 Researcher discover a 2D material that possessed an intrinsic ferromagnetism. 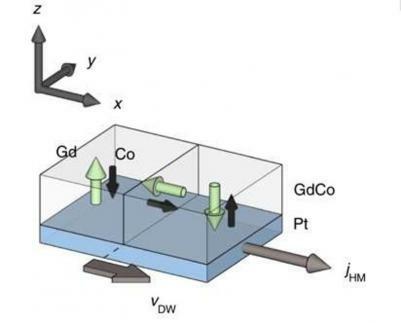 Researchers from the DoE's Lawrence Berkeley National Laboratory discovered that 2-D chromium germanium telluride (CGT) feature an intrinsic ferromagnetism. Up until now it was not clear whether magnetism could survive in such thin materials - but this discovery proved that it could of course. The CGT flakes were produced using exfoliating (the scotch-tape method, the same one used to produce graphene in Manchester in 2004). This discovery can lead to extremely thin spintronic devices. Researchers at Tohoku University managed to find the origin and the mechanism of ferromagnetism in Mn-doped GaAs. This phenomonon has been puzzling researchers for over 20 years, and this new explanation may help to accelerate the development of spintronic devices made from such materials. 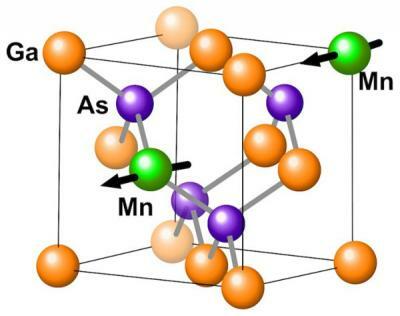 Mn-doped GaAs crystals exhibit characteristics and properties of both semiconductor and magnet. It is possible to use an electric field to control the magnetism in such materials - which makes them very appealing candidates for spintronic devices. Researchers from Japan and Vietnam report an iron-doped ferromagnetic semiconductors at room temperature. They say this is the same time that a ferromagnetic semiconductor is demonstrated, which is seen as a promising spintronic device material. The researchers say that current theory predicted that a type of semiconductor known as "wide band gap" would be strongly ferromagnetic, and most research focused on that approach. But the researchers chose a narrow-gap semconductor (both indium arsenide and gallium antimonide were chosen) as the host semiconductor, which enabled them to obtain ferromagnetism and conserve it at room temperature by adjusting doping concentrations. Researchers from Germany, France and the UK managed to switch on and off robust ferromagnetism close to room temperature by using low electric fields. 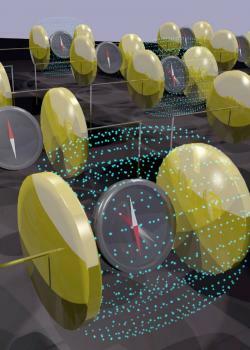 They hope such work will lead to applications in low-power Spintronics devices. Researchers developed a new technique called HARPES (Hard x-ray Angle-Resolved PhotoEmission Spectroscopy) that can be used to investigate the bulk electronic structure of different materials. In the first application, they checked the bulk electronic structure of the prototypical dilute magnetic semiconductor gallium manganese arsenide, and discovered that the material’s ferromagnetism arises from both of the two different mechanisms that have been proposed to explain it. Understanding the source of ferromagnetism in dilute magnetic semiconductors is an important milestone toward using these materials in Spintronics devices. HARPES, which is based on the photoelectric effect, enables scientists to study bulk electronic effects with minimum interference from surface reactions or contamination. It also allows them to probe buried layers and interfaces that are ubiquitous in nanoscale devices, and are key to smaller logic elements in electronics, novel memory architectures in spintronics, and more efficient energy conversion in photovoltaic cells. According to Thomson Reuters a Spintronics researcher is a likely likely to be in contention for Nobel honors in Physics. They say that Hideo Ohno, Professor of the Laboratory for Nanoelectronics and Spintronics in Tohuku University is Japan may get the price for his contributions to ferromagnetism in diluted magnetic semiconductors.